Gluten sensitivity can contribute to a variety of health problems. If you think you may have a sensitivity to gluten, you’ll want to know there are different reasons for it, and different symptoms. Some of the symptoms are more obvious, like those experienced with Celiac Disease. And although the current treatment is the same – to eliminate ingestion of gluten – for some people it may be more immediately critical than for others, especially for Celiacs. Gluten sensitivity is a general term that covers a wide variety of problems with gluten. Non-Celiac sensitivity to gluten may imply that the problem is not as serious as Celiac Disease, but that may not be the case. There may not be immediate symptoms, but hidden problems may lead to more serious problems. Undefined Sensitivity to Gluten: where elimination of gluten from the diet results in health improvements, but there hasn’t been a clear diagnosis of Celiac or allergy. This is the category many people fall into for a variety of reasons. For some people this is because the symptoms are hidden and waiting to show up. For others it’s because of going gluten free before being tested. I’m in this category: We are told that even if we have Celiac disease we may not get a positive test because our intestines may have completely healed. We would have to go back to eating gluten to get a positive diagnosis. I’m not so sure I want to get that sick, so I may just stick with saying I have gluten sensitivity. Except for gluten allergy, the terms being used for gluten sensitivity aren’t clearly separated in how they are used. In fact, I’ve seen all of the following terms used to refer to Celiac Disease. But they are also used in other ways. The term gluten intolerance is often used as a synonym for Celiac Disease or other sensitivity to gluten. For people like myself who fall into the category of diagnosis limbo, the term sensitivity sounds kind of unimportant, and not very serious (wimpy comes to mind). Since I know I have a real problem with gluten I tell people I’m gluten intolerant rather than gluten sensitive. That way I have a better chance of being taken seriously even though I haven’t been diagnosed with Celiac disease or a gluten allergy. I’ve heard other people do this too. Sometimes you just need to get your point across. Celiac Disease is a specific type of disease: an autoimmune disease where the body attacks it’s own cells when gluten is present. But even Celiac Disease can be confusing and its definition is being disputed. A positive diagnosis for Celiac disease usually doesn’t come until a biopsy shows damage to the intestines. But many people have negative biopsies over a period of many years, then finally have a positive one. In the meantime they are labeled gluten sensitive, and often not taken seriously. You can find out more about Celiac Disease here. Gluten-sensitive enteropathy is a medical term. Enteropathy is a pathology, or disease, of the intestine. So in this case it’s an intestinal problem associated with sensitivity to gluten. I’ve seen this term used as a synonym for Celiac Disease, and I’ve heard it used to describe a range of conditions from mild inflammation of the intestines to Celiac Disease itself. To complete this cycle of confusion, the current view of Celiac Disease has a wide range of symptoms, from the classic diarrhea and weight loss to some symptoms which are considered to be merely “sensitivities” in some circles. The inflammation I mentioned above is considered to be the forerunner to Celiac Disease by some, and as a version of it to others. Hopefully one of these days studies will come together that will help clarify the definitions. In the meantime, many people are feeling better by limiting themselves to a diet of gluten free foods regardless of not having an official diagnosis. You can learn more about gluten sensitivity and Celiac Disease from the Celiac Nurse, Shelly Stuart, in her well researched and informative book Gluten Toxicity: The Mysterious Symptoms of Celiac Disease, Dermatitis Herpetiformis, And Non-Celiac Gluten Intolerance. Shelly has been a registered nurse for over 22 years including over 5 years in gastroenterology–and she has lived successfully for over 7 years with Celiac Disease herself, so I feel her perspective is well-informed and worth listening to. 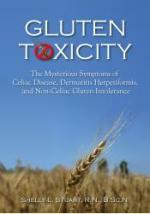 Gluten Toxicity is available in print from Amazon, and as a downloadable PDF from Shelly's blog, Celiac Nurse.